We’ve heard Tom Lewers’ name before, he’s been around a while in Rolls-Royce, Barclays and elsewhere, but never really met him properly. So introducing him as chair of the afternoon break-out strand at ProcureCon Indirect the other week was a pleasure and a chance to see what he has been doing as CPO at Royal London, the UK’s largest mutual (member owned) insurance company. His presentation was titled “Supplier Enabled Innovation”, which he defined as “solving business challenges through collaborating with a select number of genuinely strategic suppliers, embracing their deeper knowledge and capabilities than in your own organisation, for mutual benefit”. “Innovation” in and via procurement is of course a hot topic these days. But this was one of the very best sessions I’ve seen on the subject, as it showed both conceptual understanding of the issues as well as real achievement in a sector that perhaps does not immediately suggest itself as a hotbed of more general innovation – unlike pharma or tech, for instance. A serious approach to SRM (supplier relationship management) lies at the heart of Lewers’ approach, which is to look to develop “transparent, trusted and compatible relationships”, with procurement acting as a facilitator, connecting the business and the supplier. Rather, organisations that score highly on two sets of characteristics, “trust” and “control” are those that are most likely to work as partners in innovation. Lewers expanded on those headings; the idea of compatibility is key, as well as some harder factors such as capability and a commitment to continuous improvement. And executive sponsorship from both sides is key. One real nugget that everyone should remember was his distinction between firms that want to be innovation partners and those that can actually do it. We won’t name names, but he mentioned one huge global software firm that simply has no interest in “partnering” – their business model is fundamentally about maximising revenue from a pretty non-negotiable range of products. Another huge software and IT services business wants to partner, seems to have a genuine willingness – but just cannot move fast enough (certainly for Lewers’ liking) and be responsive because of its own internal constraints and bureaucracy. Unsurprisingly, that often takes the buyer towards smaller, younger, more nimble firms. 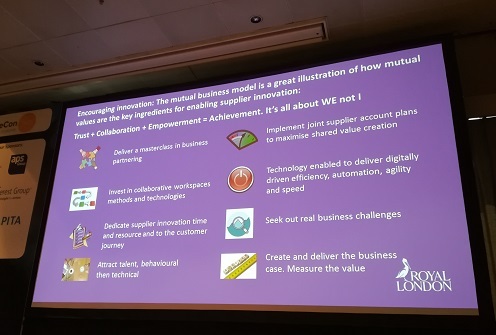 He also made the link between the “mutual” nature of Royal London and this sort of supply chain collaboration – mutual values are also actually key ingredients for enabling supplier innovation. Or, as he put it, Trust + Collaboration + Empowerment = Achievement. In terms of results, Lewers talked about a change in legislation that opened up opportunities for insurance firms to offer a new product line. Because Royal London found a key technology partner (supplier) who could help make this happen very quickly, they were first to market with the new product, which was worth many millions of new business to the firm. There was more wisdom and advice (see the picture for one of his final slides), but overall this was a presentation that we’re confident every person listening would have taken away something of value - just what you want from a conference session really. And we hope that’s not the last time we get the chance to talk to Tom Lewers about his ideas and experience.